Once in a while, mum will cook Tau Yu Bak (stewed pork in soya sauce). I like this dish as it compliments rice very well. The rich stew tastes heavenly when poured over the rice and the meat is usually very tender by the end of cooking time.Tau Yu Bak can be cooked using either belly pork or even pork ribs. 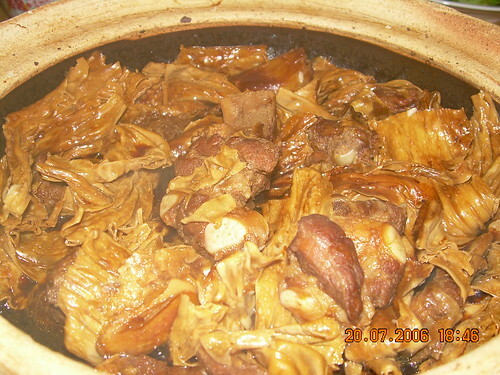 In this picture, pork ribs are used together with tau ki (which is soya sheets).You can also add hard boiled eggs or even tau pok (fried beancurd) as extra ingredients. Taste can be a matter of individual preference and also depends on the type of dark soya sauce you use. Dark soya sauce (and even light soya sauce for that matter) differs in taste from one brand to another due to the individual recipe in the fermentation process. Some tastes saltier than others. Some tastes sweeter than others. For us, we usually source our dark soya sauce from our hometown in Pontian Kecil, Johor, Malaysia. Heat pot. Add sugar. Once sugar caramelised, add meat and coat it with caramelised sugar to lock juices in. Once start to boil, close lid, reduce heat and simmer for 1 hour. Then add tau ki and simmer for a further 30 minutes. Add boiling water is stew becomes too dry.